Why should you use grow bags? A recent study in Texas showed the root of plants grow faster in Grow Bags, because grow bags allow oxygen to penetrate the walls of the pot. Grow bags could let extra water out when you watering, which prevent many problems associated with over watering like root rot. Grow bags could revents roots from circling, Decreased risk of transplant shock. There are many grow bags to choose from on Amazon. Why do you choose from us? Meterial Made with 100% non-woven landscape fabric, BPA-free and environmental-friendly felt. 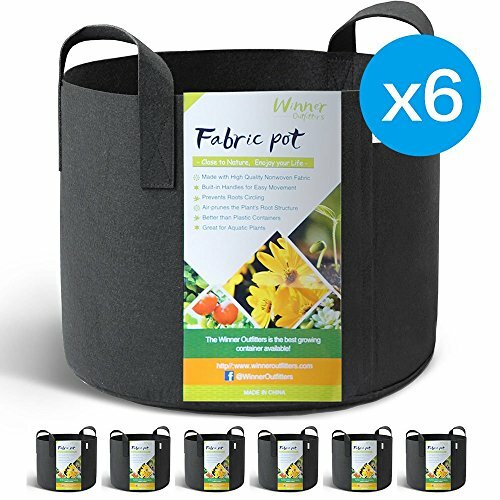 Durable Compare other grow bag, we have more than one process in sewing to ensure our fabric pot is durable. Way Too Easy Money Back Promise Our promise is that our product is just as great, better or the best out there and we back it with our crazy promise. If you are are unsatisfied with our grow bags, you could contact us and tell us your reason, then we will give you your money refund within 5 hours and you can keep the grow bags. If you have any questions about this product by WINNER OUTFITTERS, contact us by completing and submitting the form below. If you are looking for a specif part number, please include it with your message.